There's nothing quite as indulgent as ordering caviar service in a restaurant with a good bottle of bubbly. But it's just as easy to serve it to your guests--at a fraction of the cost. 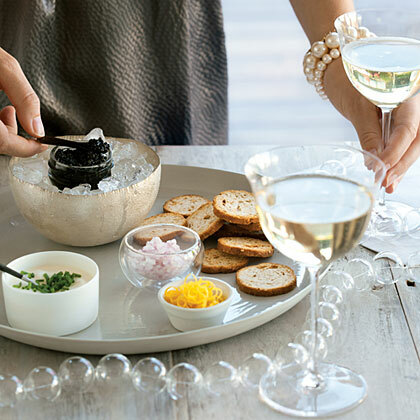 Set caviar jar in a small bowl of ice on a plate. In smaller, individual dishes, put creme fraîche, shallots, chives, and lemon zest. Serve with melba toast or toasted baguette slices. *Order sustainable California caviar from Tsar Nicoulai Caviar (tsarnicoulai.com).